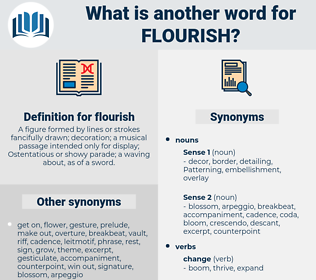 What is another word for flourish? A figure formed by lines or strokes fancifully drawn; decoration; a musical passage intended only for display; Ostentatious or showy parade; a waving about, as of a sword. wast up ones ears in. grow, proliferate, flower, develop, developing, succeed, evolve, expand, unfold, development. hinder, decrease, wither, cease, languish, lessen, fail, shrink, shrivel, stunt, lose. diffidence, reserve, timidity, retirement, shrinking, struggle, flounder, quietness, modesty, unobtrusiveness. So it is with all the arts and all the sciences - they flourish best by the addition of but little new at a time in comparison with the old. Not " proud Preston" alone - a small town at his birth, a mighty place of manufacture now - has Arkwright made to grow and flourish. 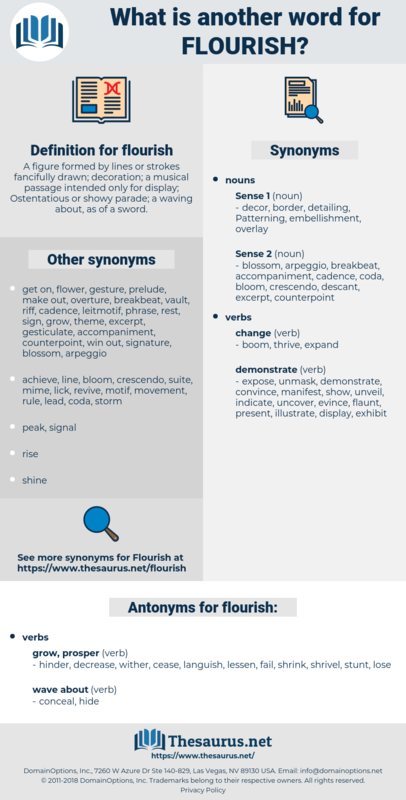 grandiloquence, grandiosity, embellishment, ornateness, magniloquence, motion, rhetoric, gesture.